I have often started and failed the “competition” that is National Novel Writing Month. 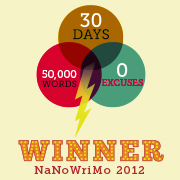 The challenge is to write 50,000 words in 30 days. I have failed at it at least three times that I remember. Probably closer to five or six. In the past I have come up with endless excuses for dropping out that included: this is a silly endeavor that will result in a poor product; this is a waste of time; this isn’t going anywhere so why bother? ; I have real work to do! ; I hate this story and the characters and myself for writing it; I am really too busy to do this in November! Needless to say I was wrong about all of those things. And what I was really wrong about was that the lesson (for me) was the journey itself. It was the discipline (which I guess I thought I lacked). It was the journey I forced myself to go with characters (and myself) even when I disliked them (and me). I learned about my creative process. I learned about sticking with something I created even when it was going horribly off the rails. I learned I need to have a better road map for long-form fiction. I can’t keep everything in my head at once, it’s just not who I am. More than anything? I learned that I really can do what I set out to do with the proper tools and mind-set. And that’s the most important lesson of all. This has inspired me to tackle some further challenges. I am thinking of editing the entire thing–it needs A LOT of work to put it kindly. So the editing itself will be another journey. Recently I’ve worked with and known a few people looking to self-publish their own manuscripts and I’m considering going through that process–not because I’m looking to be the next Jamie McGuire or Jessica Park (both self-published and had huge hits with their books that caught on like fire). What I’d like to do is understand the process so I’m of more help to my author clients.